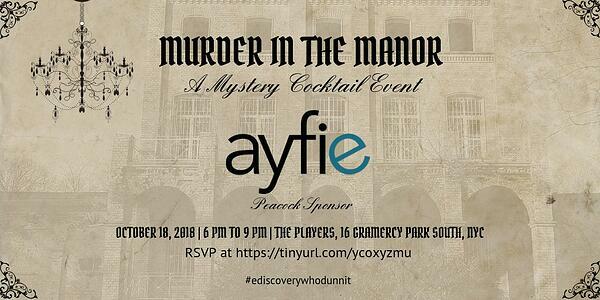 The Murder in the Manor even will be held at historic The Players Club, a private social club founded in New York City by the noted 19th-century Shakespearean actor Edwin Booth, the brother of the infamous John Wilkes Booth. By buying a ticket here, you can join us at the luxurious mansion located across from Gramercy Park and immerse yourself in the historical, theatrical and art pieces and a bit of the macabre. The task of the evening is to try and uncover 7 clues in each of the 7 different rooms of the manor. Complimentary wine and hors-d'oeuvres will be served throughout the evening to mark the special occasion. Some of our ayfie team will be at the event. Let us know if you want to meet up!